The Global Malaise Trap Program (GMP) is an international collaboration between the CBG and multiple contributors from around the world. Results from the Canadian National Parks (CNP) Malaise Program have now been incorporated into the larger GMP dataset leading to a total of 158 sampling sites across 33 countries. The program represents the first step toward the acquisition of detailed temporal and spatial information on terrestrial arthropod communities across the globe. To date, over 2M specimens have been sequenced through the GMP, representing over 153K species. Past efforts to include arthropods in terrestrial assessments have faced two barriers: ineffective sampling due to habitat complexity, and unreliable tools for species identification. The latter barrier has now been circumvented by DNA barcoding, a method that utilizes sequence variation in a standardized gene fragment to rapidly sort and objectively differentiate species. 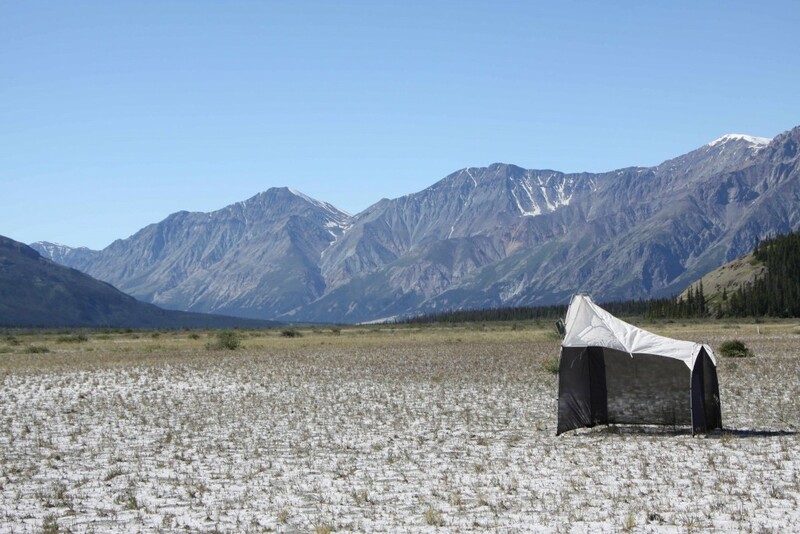 Malaise traps are tent-like structures that are effective at capturing insects from various groups and are easily deployed and cost-effective. Used in combination with DNA barcoding, this approach makes it possible to carry out large-scale sampling programs and enables a time- and cost-efficient approach for biodiversity assessments around the world. CBG provides a standard sampling kit to all GMP participants. This includes a brand new Townes style Malaise trap and typically a year’s worth of collection bottles. Partners provide ethanol for killing and preserving samples and are responsible for changing the collection bottle once every week for the duration of the flight season. All collection bottles are shipped for subsequent processing at CBG. Samples are accessioned, specimens were identified to order, arrayed, labeled, databased, and tissue-sampled for genetic analysis. All arthropods are barcoded, with the exception of a few very common species of Collembola, where only a few individuals from each trap sample were analyzed. Standard barcoding protocols are followed to recover the barcode region of cytochrome c oxidase subunit I (COI) gene. The barcode sequences, specimen images and collateral data are uploaded to BOLD under the ‘Global Malaise Program’ campaign. 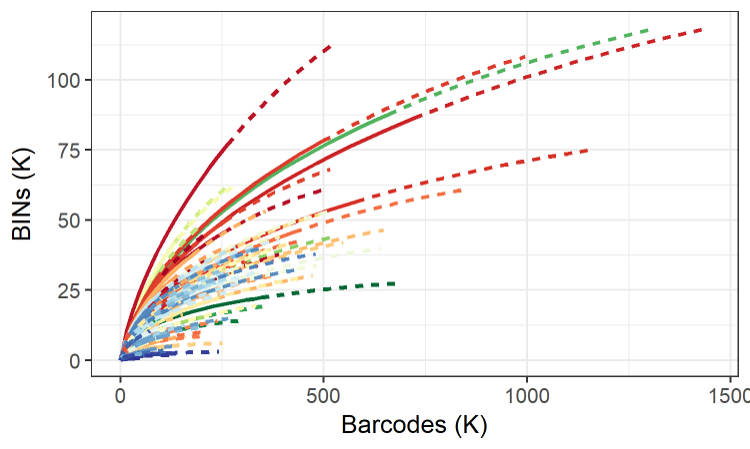 Barcoded specimens are assigned to an existing or new Barcode Index Number (BIN), a proxy for a formal Linnean species name, as outlined by Ratnasingham & Hebert (2013). Identifications are assigned by the BOLD-ID Engine where possible, allowing preliminary species inventories to be completed for each location and facilitating comparisons among them. Reports are generated upon completion of analysis for a single GMP site. 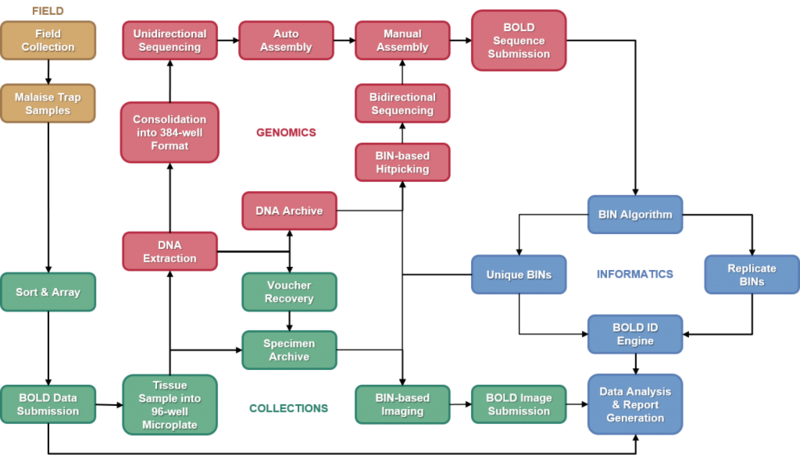 They include a taxonomy list, image library, neighbor-joining tree, and different comparisons with other analyzed GMP locations. The whole program moves forward through collaborative efforts where each country is creating a species inventory and barcode library for itself but shared BINs between countries therefore allow for concurrent identifications between collections. Complete GMP species accumulation curve for all of the 130 sites completed as of September 2018, indicating progress through 2015 (69 sites completed) and 2017 (117 sites completed). 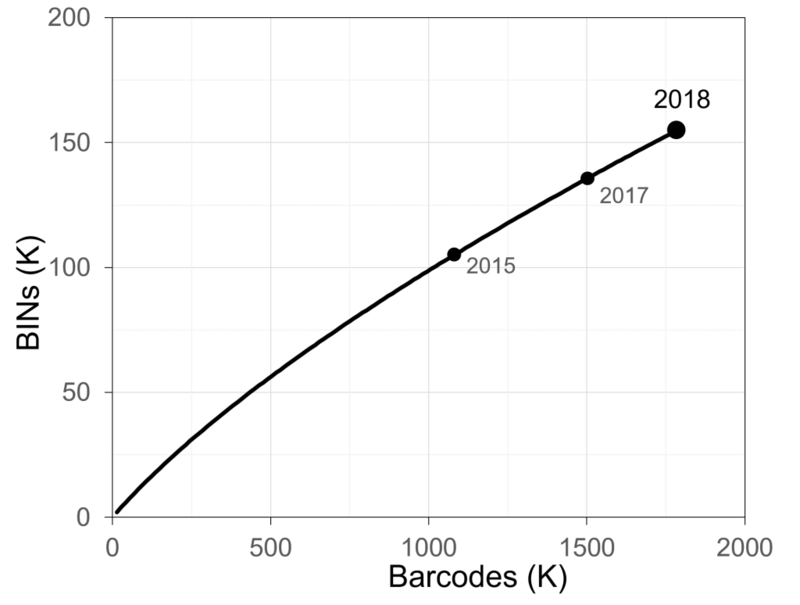 Species accumulation curve for each of the 130 sites. Solid line segment represents the rarefaction curve, the dashed line segment extrapolates the curve to double the observed sample size. Colours indicate a gradient in latitude with blue shades in the Northern hemisphere, red shades near the equator, and green shades in the Southern hemisphere. 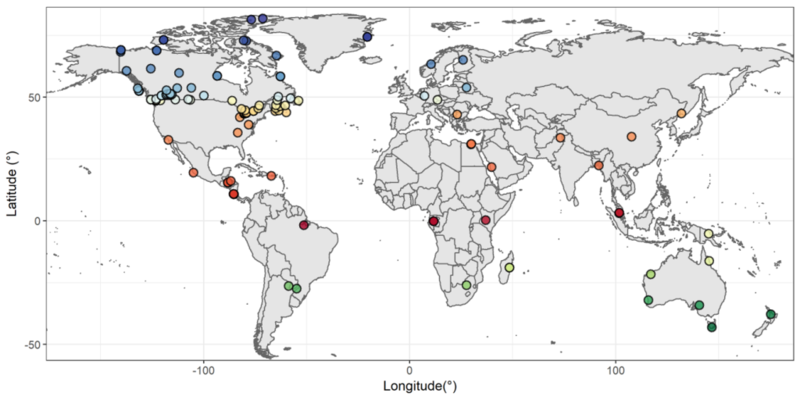 Variation among sites in observed BIN diversity with latitude (P<0.001 and r2=0.80). The size of points indicates the number of specimens. 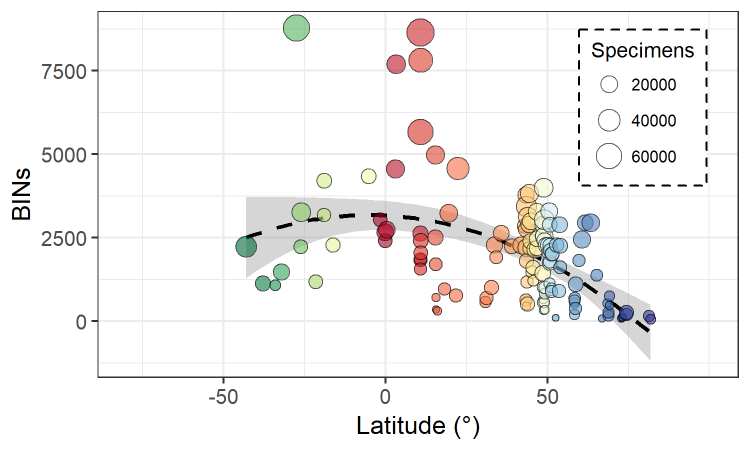 The P and r2 values reflect overall model statistics while the regression line indicates the significant effect of latitude.